Buffalo Thunder Casino is located in Santa Fe, New Mexico. Buffalo Thunder Casino and Resort in Santa Fe became the second New Mexico casino to open a land-based sportsbook. After the US Supreme Court ruled to strike down a federal ban on sports betting, New Mexico tribes have the right to offer sportsbook services — if it is allowed under the tribe’s gaming compact. Santa Ana Star Casino, owned by the Santa Ana Pueblo, opened a sportsbook in October 2018. The new sports betting operation outside Santa Fe is called the Thunder Race Book. Thunder Race Book has several associations. According to Gaming Today, three different sports gambling entities will be involved in the new sportsbook and racebook: South Point Hotel, Las Vegas Dissemination Co., and National Sports Book Management. Last year, the U.S. Department of the Interior’s Office of Indian Affairs reviewed the New Mexico gaming compacts and determined that all Class III forms of gambling are allowed. That includes sports betting, so the Interior Department gave their approval for sports wagers. Presumably, the Buffalo Thunder Casino and Resort follows the same pattern. If so, it is a radical departure from the recent history Buffalo Thunder Casino has faced. Buffalo Thunder Casino and Resort, owned by the Pojoaque Pueblo Tribe, is emerging from years of controversy and conflict with the New Mexico government. Former Gov. Susana Martinez sought to raise taxes on the Pojoacqu Pueblo’s casino revenues without offering concessions, which the 1988 Indian Gaming Regulatory Act stipulates a state must do. The two sides negotiated a new gaming compact while fighting a legal battle. 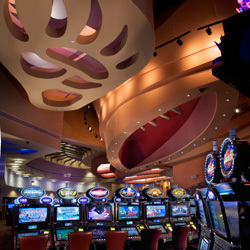 Or better put, the two sides failed to reach a deal as the Pojoaque Pueblo continued to operate their casino without a new gaming compact for over two years. In a legal sense, the battle was back-and-forth, with each side winning legal decisions at one point or another. A judge gave the Martinez administration the key victory in the legal battle. By that time, a new US Attorney General was in office. Eventually, the Martinez administration received support from the U.S. Department of Justice over another matter. In 2017, US Attorney General Jeff Sessions threatened federal sanctions against Buffalo Thunder Casino, if it continued to operate leased slot machines. The tribe complied under threats of charges from the Justice Department. Gov. Michelle Lujan Grisham, who took over in January, appears to be much more sympathetic to the Pojoaque Pueblo. Lujan Grisham took $29,500 from Native American casino operators, including the Sandia, Fort Sill Apaches, and Pojoaque Pueblo tribes — which each gave $5,500 to the new governor’s campaign. Since the Pojoaque Pueblo Tribe is a political donor, it is expected in the new year that Gov. Lujan Grisham’s adminsitration will end the yearslong standoff with the Buffalo Thunder Casino. The tribe’s decision to open a sportsbook in the Buffalo Thunder Casino is a further sign that the tribe’s leaders feel confidence in the current mileau to launch a new venture — a venture which would have been seen as a challenge to the state administration just a year ago. Copyright © USPokerSites.com Inc. All rights reserved.